2012 was a perfect year for Cantiere delle Marche, with numerous orders and launches (Percheron and Furst 60). And the young Italian yard continues its success story in 2013 with the announcement of a new order. 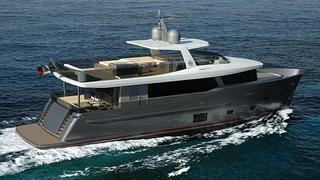 Like the Nauta Air 86 sold in 2012, this new 26.82m Nauta Air 88 explorer yacht is a customised version of the 80 model. Presented last year, this new pocket superyacht is designed by Nauta is already a success. Built in aluminium, the yachts offer large volume and modern styling combined with a fuel-efficient seaworthy hull. Vasco Buonpensiere, CdM’s Sales & Marketing Director, comments: 'I would like to thank the owner of this new Nauta Air 88, his great captain and all the CdM and Nauta Yacht Design teams that worked together day by day until we have all reached this brilliant result'. The interior, entirely customised, will accommodate eight guests in four cabins. The Nauta Air 88 explorer yacht will be delivered to her North European owner, a famous architect, in July 2014.